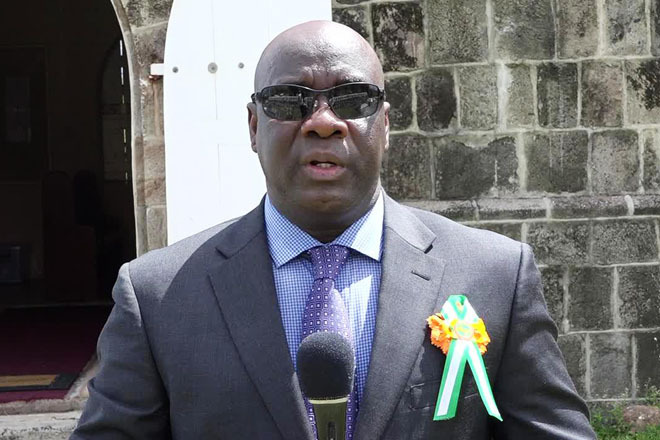 NIA — Minister responsible for Public Utilities on Nevis Hon. Alexis Jeffers, says the week of activities to mark the Nevis Electricity Company Limited’s (NEVLEC) 17th Anniversary is fitting. The minister made the comment when he spoke to the Department of Information, moments after the company’s Service of Thanksgiving at the St. James Anglican Church on August 27, 2017. The event ushered in a week of activities to mark the occasion, culminating with an Awards Dinner and Dance at the Four Seasons Resort on September 02, 2017. “I believe by the time the 20th anniversary comes around, some of the folks who are with us now would have reached the age of retirement and would not be with us… So while they are with the company, we want to give them all of the accolades and recognition that is due to them,” he said. Mr. Jeffers also stated that another significant reason for the celebration is an opportunity for the company to re-establish itself as one of the better companies on Nevis and to ensure that its image, in the eyes of its customers, is one which is akin to the continued production of electricity. The calendar for the week of activities, which was announced earlier this month by Ms. Paulette Hanley, Chairman of the 17th Anniversary Planning Committee, has since had one alteration. Mr. Jeffers referred to the change saying that the ceremony, which was scheduled to mark the commissioning of the new Wӓrtsilӓ 3.8 megawatt generator at the Prospect Power Plant on August 28, 2017, has been rescheduled to August 11, 2017. He said it was due to the unavailability of key persons who should be at the ceremony. Other activities are – a presentation of gifts to the Flamboyant Nursing Home and the St. Georges and St. Johns Senior Citizens Home on August 29, 2017, A Customer Appreciation Day at the Customer Service Parking lot in Charlestown from 8 a.m. to 3:30 p.m. on August 30, 2017, on August 31, 2017, a Health Walk for staff members and an Open Day on September 01, 2017. The Public Utilities Minister used the opportunity to thank members of the planning committee. He also expressed hope that the event will become an annual one with a special celebration when the milestones come along.